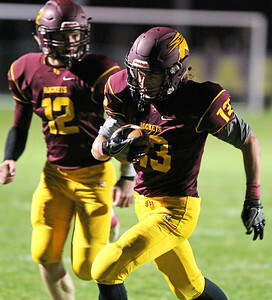 H. Rick Bamman - hbamman@shawmedia.com Richmond-Burton's Blaine Bayer runs up the middle for a huge gain Friday, Oct. 7, 2016 in the second quarter in a Kishwaukee River Conference game. 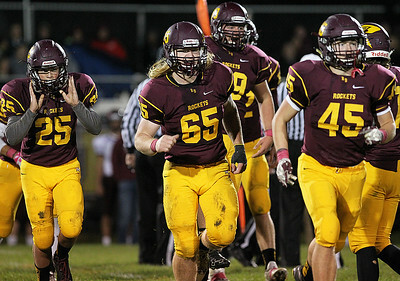 Richmond-Burton won, 39-28. H. Rick Bamman - hbamman@shawmedia.com Richmond-Burton's bench including Kenneth Eckardt, (from left) Sean Cook, Johnathon Dodaro, Herve Schwab and Michael Kaufman react to Shane Byrne's second quarter tounchdown Friday, Oct. 7, 2016 in a Kishwaukee River Conference game against Marengo. 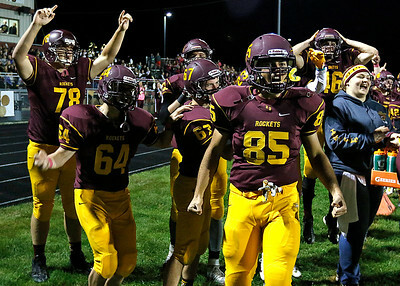 Richmond-Burton won, 39-28. H. Rick Bamman - hbamman@shawmedia.com Richmond-Burton's Blaine Bayer runs in for a touchdown in the first quarter Friday, Oct. 7, 2016 as quarterback Brady Gibson trails the play. 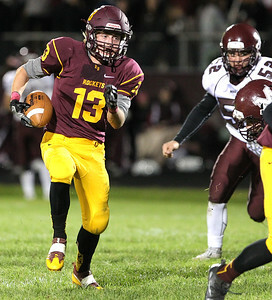 Richmond-Burton beat Marengo 39-28. 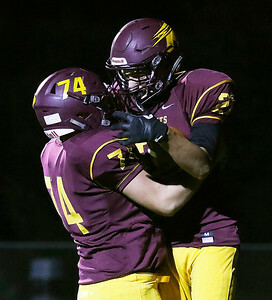 H. Rick Bamman - hbamman@shawmedia.com Richmond-Burton's Shane Byrne (right) celebrates his second quarter touchdown Friday, Oct. 7, 2016. with teammae Zachary Suhr in a Kishwaukee River Conference football game against Marengo. 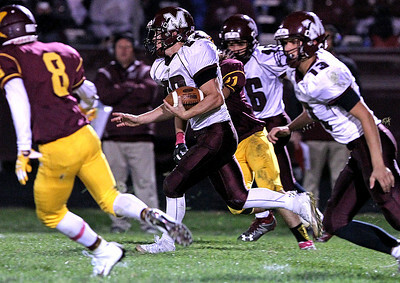 Richmond-Burton won, 39-28. H. Rick Bamman - hbamman@shawmedia.com Richmond-Burton head coach Patrick Elder signals his players in the first quarter Friday, Oct. 7, 2016 against Marengo in a Kishwaukee River Conference game. 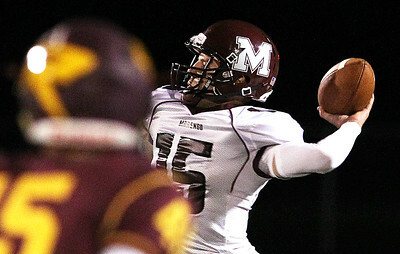 H. Rick Bamman - hbamman@shawmedia.com Marengo's quarterback Eric Mackey throws a pass Friday, Oct. 7, 2016 in a Kishwaukee River Conference game against Richmond-Burton. H. Rick Bamman - hbamman@shawmedia.com Marengo's Jake LaSota catches a Eric Mackey pass for eight yards in the firat half Friday, Oct. 7, 2016 in a Kishwaukee River Conference game. Richmond-Burton won, 39-38. H. Rick Bamman - hbamman@shawmedia.com Marengo's Joseph Mier returns a kick off through traffic on Friday, Oct. 7, 2016 for a huge gain in the second quarter of a Kishwaukee River Conference game against Richmond-Burton. 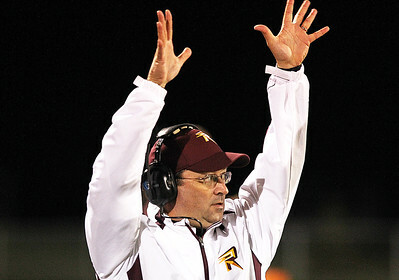 Richmond-Burton won, 39-28. 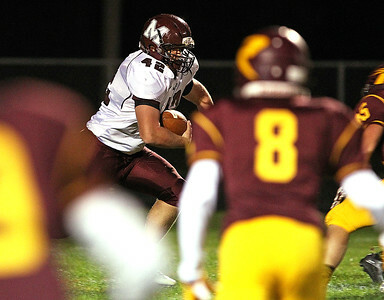 H. Rick Bamman - hbamman@shawmedia.com Marengo's David Paar gains four yards in the first quarter Friday, Oct. 7, 2016 in a Kishwaukee River Conference game against Richmond-Burton. H. Rick Bamman - hbamman@shawmedia.com Richmond-Burton's Alex Perez returns the opening kick off Friday, Oct. 7, 2016 against Marengo in a Kishwaukee River Conference game. 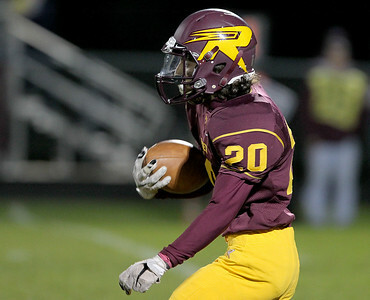 Richmond-Burton won, 39-28. H. Rick Bamman - hbamman@shawmedia.com Richmond-Burton's Ryan Zimmer (from left) Robert Berwick, Samuel Battalini and Kevin Pedley react Friday, Oct. 7, 2016 after stopping Marengo on fourth down in the second quarter during the Kishwaukee River Conference game. 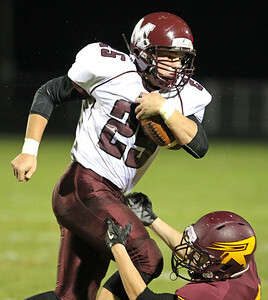 Richmond-Burton won, 39-28. 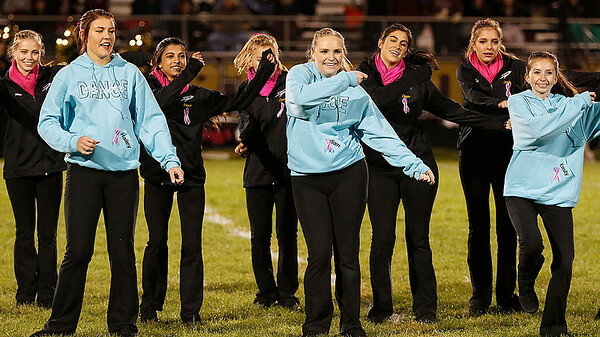 H. Rick Bamman - hbamman@shawmedia.com The Richmond-Burton Rocketts perform during halftime on Friday, Oct. 7, 2016. 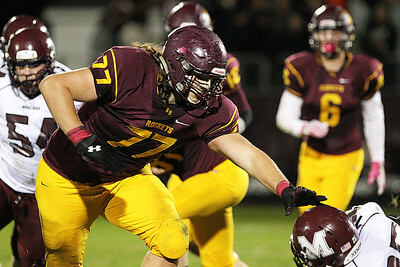 H. Rick Bamman - hbamman@shawmedia.com Richmond-Burton's tackle Dalton Wagner blocks against Marengo Friday, Oct. 7 in the Kishwaukee River Conference game. 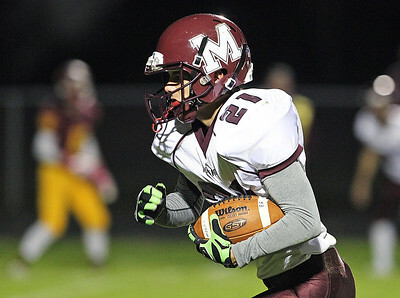 Marengo's David Paar gains four yards in the first quarter Friday, Oct. 7, 2016 in a Kishwaukee River Conference game against Richmond-Burton.